As the Party winds down its investigation of Zhou Yongkang, get ready for another high-profile trial. The South China Morning Post reported today that Beijing has begun briefing high-ranking officials on the Party’s investigation into Zhou Yongkang, a former Politburo Standing Committee member and former Minister of Public Security. SCMP writes that briefings “are customary at the culmination of highly sensitive cases,” meaning that the Party might be wrapping up Zhou’s case. If the Party decides to officially charge Zhou with graft, he would be the highest ranking Party member ever prosecuted for corruption. There have been rumors about a possible Zhou Yongkang investigation since 2012, ever since the scandal surrounding Bo Xilai erupted. 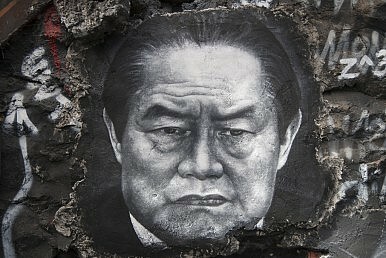 Bo was a political ally of Zhou’s, and there were rumors that Zhou alienated himself from other leaders by trying to prevent any punishment of his acolyte. Ever since then, the Party’s nets have slowly tightened around Zhou. Investigators began probing current or former high-ranking officials at each of Zhou’s power centers. In Sichuan, where Zhou had served as party chief, former deputy governor Guo Yongxiang and former deputy party chiefs Li Chongxi and Li Chuncheng were targeted. Former vice-minister of public security Li Dongsheng is also under investigation, as are several high-ranking executives from the China National Petroleum Corporation, where Zhou used to be a senior manager. When the South China Morning Post initially reported that Zhou was under investigation back in August 2013, its sources said that “President Xi Jinping and his administration are determined to use the case to galvanize the anti-graft campaign.” Targeting such a high-profile, high-ranking Party official would certainly lend a new aura of legitimacy to Xi’s year-long anti-corruption campaign. No previous leader has prosecuted a former Politburo Standing Committee member. By doing so, Xi’s campaign would set a historic precedent. There have also been rumors that Zhou is being targeted out of political motives. Some of the more sensational rumors surrounding the case claim that Zhou opposed Xi Jinping’s rise to power — and that he even tried to have Xi assassinated [Chinese]. While that’s obviously a bit far-fetched, it’s not unrealistic to assume that there was at least some political rivalry between Zhou and Xi, particularly as the Bo case developed. Taking down Zhou might be intended to serve as a warning to potential rivals by showing Xi’s consolidation of power. “Xi can’t build his authority if he doesn’t fight a real big tiger during this anti-corruption campaign,” a source told The Sydney Morning Herald. Whatever the motivation, it appears clear that Zhou is now firmly ensnared. Reuters reported back in December that Zhou was under house arrest, and noted that he had not been seen since October 1. In addition to his former aides, his son Zhou Bin is reportedly cooperating with authorities. With the investigation reportedly drawing to a close, the biggest remaining question is whether or not Zhou will be tried. Such a trial would be a major publicity coup for Xi’s anti-corruption campaign, and would also lend an image boost to China’s court system. The trial of Bo Xilai was used to similar effect. A commentary published in Xinhua praised the “unprecedented openness and transparency in the trial of Bo Xilai.” The article added, “Such cases involving senior officials once again highlighted the application of the rule of law for every organization and individual in the country, including CPC members, no matter how high their posts.” It’s easy to imagine a similar narrative unfolding around a potential Zhou Yongkang trial. However, there are risks as well. One interesting (but unsubstantiated) story from the overseas Chinese-language Epoch Times claimed that recent stories about the offshore financial accounts of Chinese leaders’ family members were the result of political leaks — a warning from Zhou’s supporters to Xi’s camp that “if you want to die, we’ll die together.” Zhou was influential and a public trial might cause divisions within top Party leadership. Of course, analysts made the same argument about Bo Xilai, yet the Party proceeded with his trial. There are other risks. The Party might be reluctant to bring charges against Zhou in court precisely because he was so high-ranking — revealing the extent of his financial crimes could reflect poorly on the Party. Still, the SCMP article wrote that “the amount of money involved in the case would be far less than some reports have suggested.” That’s a possible indication that the Party will try Zhou with charges involving sums of money large enough to convict him, but not big enough to completely outrage the public. Ever since gaining power, Xi has continuously surprised foreign onlookers with his control of the Party. It’s best at this point not to underestimate him. A trial would be in keeping with the new, high-profile tack Xi is taking, both with his own personal leadership and with the anti-corruption probe. Xi seems to have realized that in the internet age, certain high-profile stories are guaranteed to leak. Rather than keeping events quiet and handling them under the table, Xi seems to prefer going public with a carefully controlled narrative. To this point, state media have remained silent about Zhou Yongkang but have not shied away from covering the arrests of his former aides. His name is considered a sensitive word on the Chinese internet, but the Chinese social media specialists at Tea Leaf Nation wrote in December that enterprising netizens were still finding ways to speculate on Zhou’s fate. We saw the same mix of official silence and internet speculation during the early stages of the Bo Xilai affair. But that state media silence was eventually broken. When the official announcement on Bo’s crimes came out it was a doozy — Bo was not only accused of embezzlement but of “seriously harming the interests of the state and people.” That paved the way for a flood of Party-sanctioned articles on Bo, his crimes, and the triumph of anti-corruption forces and the rule of law. As the investigation into Zhou Yongkang winds down, look for a state media response that advances a similar narrative. As with Bo Xilai, the case of Zhou Yongkang is simply too big to brush under the rug. Xi will once again gamble by going public.